Run the Windows .exe setup by mounting the ISO or by connecting the Windows USB installation drive from the File Explorer. Windows 10 has native support for ISOs by right-clicking and choosing Mount or by using the following PowerShell command: Mount-DiskImage -ImagePath "C:\FileName.ISO" After that, you will have the choice to upgrade your copy of Windows now or to create an installation ISO or USB drive. You might be directed to download updates before this, then the installation option will be available. The installer will start some initial setup checks and finally, it will ask what you want to keep on the new copy of your Windows. If you intend to keep your currently installed software on the repaired operating system, make sure that applications that are listed among the files. The rest of the in-place upgrade amounts to waiting about a half an hour for Windows to reinstall, which rebooted our system several times and did not require any further intervention from us. When completed, you will load back into the same Windows environment where you originally started the upgrade, except with newly installed operating system files which should be without bugs. After completing the in-place upgrade The above-mentioned procedure of reinstallation secures your previously installed software and settings, and store them in Windows.old folder. This folder is heavy due to previous Windows files and it cannot be deleted easily. 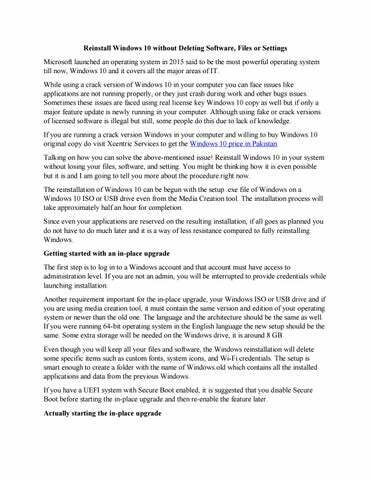 If you are using Windows 7 and Windows 8 right now then upgrade your Windows to Windows 1o because Microsoft is going to end the support for Windows 7 in 2020 and later Windows 8 support will be discontinued. To get Windows 10 price in Pakistan and comparison of different versions visit Xcentric Services.